Built in 1720, The Theatre Royal Haymarket is a Grade 1 listed building, and the third oldest playhouse in London that is still in use. With exquisite architecture, and a compelling history, the 'Little Theatre in the Hay' is not only a great place to watch plays, but a fascinating place to visit. The theatre runs tours every first Wednesday of the month at 11am. During the tour you will explore the building and discover its rich three hundred year history. Learn about John Potter, the man behind the building's construction, find out how a French troupe of actors saved it from closing down, and see the famous No. 1 backstage dressing room. The theatre has housed some of the most successful plays in London, and been home to many great actors including Sir Ian McKellen and Sir Patrick Stewart in Waiting For Godot, and The Lion in Winter, starring Robert Lindsay and Joanna Lumley. 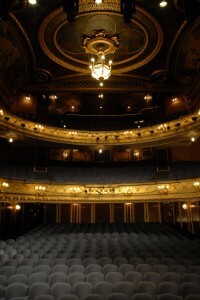 And on the tour you can find out about many of the other famous stars who have performed on the Haymarket stage. The tour is an hour and a half, with tickets costing £8.50 per person. looks like a very interesting place to visit. Nice article.